Just a “hop, skip & a jump” from the Belvedere Hotel is O’Connell Street, the main street of Dublin. Originally called Sackville Street it was renamed in 1924 in honour of Daniel O’Connell, an Irish revolutionary from the early 19th century. A statue of the famous “Liberator” stands at the lower end of the street, facing O’Connell Bridge. The Parnell Monument; statue of the dubbed “uncrowned King of Ireland” and leader of the Irish Parliamentary Party, Charles Stewart Parnell, 2 minutes walk from Belvedere Hotel. Carlton Cinema on upper O’Connell Street, one of the country’s oldest cinemas is an art deco style building designed by Robinson & Keefe. The “Spire”, officially titled the “Monument of Light”, 121.1 metres high stands on the site of the former Nelsons Pillar, is the world’s tallest sculpture. 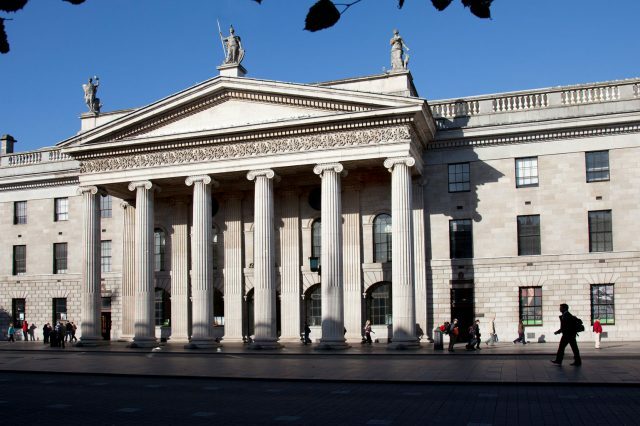 The GPO (General Post Office) was the Irish headquarters of the Easter 1916 Rising. Clerys Department Store, one of the world’s first purpose-built department stores, “under Clerys’ Clock” is a well-known rendezvous for Dubliners and visitors from the country, also famous for a place where romances began. Jim Larkin Statue – opposite Clerys Store – a key figure in Irish history, an Irish trade union and social activist is famous for his campaigning for workers’ rights and the 1913 lockout, the most significant industrial dispute in Irish history. Daniel O’Connell monument – complete with bullet holes from the 1916 rising, on the south end of O’Connell Street, over 10 metres high this bronze monument commemorates the “Liberator”. O’Connell Street leads straight onto O’Connell Bridge which is the only bridge in Europe wider than it is long. So if you are looking to explore Dublin city and the O’Connell street area check out our superb accommodation and special offers!